Minis and Kids Love Each Other ! Many years ago, when my 997 cooper was new, we went out for a run in it, on a Sunday afternoon, and as we got home Lilian had to go in, in a hurry, and I was bringing in the baby, (he's 39 now!). The phone rang, and I went through the front door to answer it. Meanwhile, my Mum, who was staying with us, shut the front door, and we sat down to our meal. When it was over, Lilian went upstairs and he was missing!! Panic! !-But we found him, enjoying a nice sleep, still in the Mini, with a very happy look on his face... ...nuff said?? 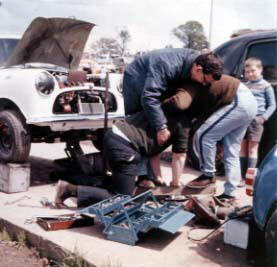 The colour picture is at Mallory Park doing an impromptu clutch change. It shows our eldest son Duncan Kenneth who only ever wanted to be a Mini racer or an Astronaut, but died aged 9 shortly after this pic. Way back when, in '74 when I was conceived, til the day I was born, my Dad had a Traveller and I would travel in this (or rather, my mother would). When I was kicking, which was often (or so my Mum says), they would drive around for a bit in the Traveller and I'd calm down again. It never worked in any other car. I reckon that's where I get my interest from. Then, Dad blew the head gasket once too often going from Catterick in North Yorkshire to Salisbury in Wiltshire (c.350 miles), trying to get back for when I was born. Net result was that the head and block were both cracked and I ended up going home from the hospital in an Austin 1300. My favorite story with my kids and my mini came last summer when a neighborhood kid offered "all the money in my piggy bank if you let me drive it!" My son's response is a classic. He said to the other little boy "It's a REAL CAR! You can't drive it; IT'S A REAL CAR!!!!! 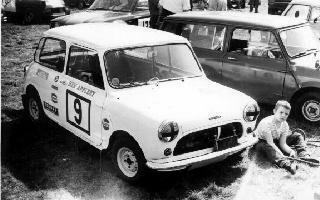 My two daughters spent many weekends at the two major tracks in Ontario, Canada: Mosport and Harewood Acres, since I was racing a Morris 850 in those days. We would get up very early on the morning of the practice day and I would fold myself into some blankets in the back seat while the kids would share the passenger seat and my wife, Yvonne, would drive us to the track. We would then camp out at the track until the racing was over. Just thought I'd try and lighten the air a little with a "kids & Minis" story which is only a few hours old. I was standing in the queue at a McDonalds restaurant on the A1 motorway near Newark, on Christmas Eve. The woman in front of me had two children with her, a girl aged maybe 7 and a boy aged about 4. I have a red Mini belt buckle which often breaks the ice - you should see how many women you catch staring "down there" when they see it. The girl had been looking around the restaurant and did a double take, then a triple take, then nudged the boy and pointed at the belt buckle. He looked at it and without hesitation shouted "Miniiiiiiiiiiiiiiiiiiiiiii!" Rocky adds: "When I had to take my web pages down, during the trouble last spring, one of my friends had to ask for a CD of the Mini animations off my web page. He said his baby son was *very* unhappy when he wasn't able to see the Minis."